**Please call our toll free phone number to order this drinking fountain. Shipping charge may vary based on your geographical location. This remote chiller can provide 8 gallons per hour of 50°F cold water to a wide variety of fountains. 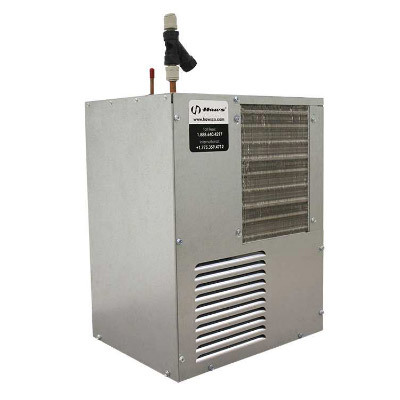 Specifically, this type chiller may be used in conjunction with a fountain in settings such as: schools, office buildings, shopping malls, and other indoor environments where there is a demand for a chilled water source. Electric water coolers are not recommended or designed for outdoor applications or enclosed pool areas (chlorine). These conditions may void warranty. Haws electric water coolers are certified to ANSI/NSF Standard 61, Section 9, comply with ARI Standard 1010 and ANSI A117.1, and be listed by Underwriter Laboratories to U.S. and Canadian standards. Efficient compact design provides 8 gallons per hour of 50. Constructed of heavy gauge galvanized steel, its compact style can be concealed under a counter, and between or within walls.